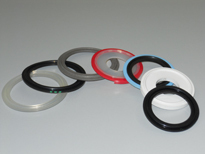 CSK-bio is able to supply a very wide range of gaskets. Materials range from Teflon, EPDM, polysteel, viton. Platinum cured silicon or silicon, buna. Sizes range from ½" to 6"
Other dimensions are also available, such as DIN ISO or DIN metrics.